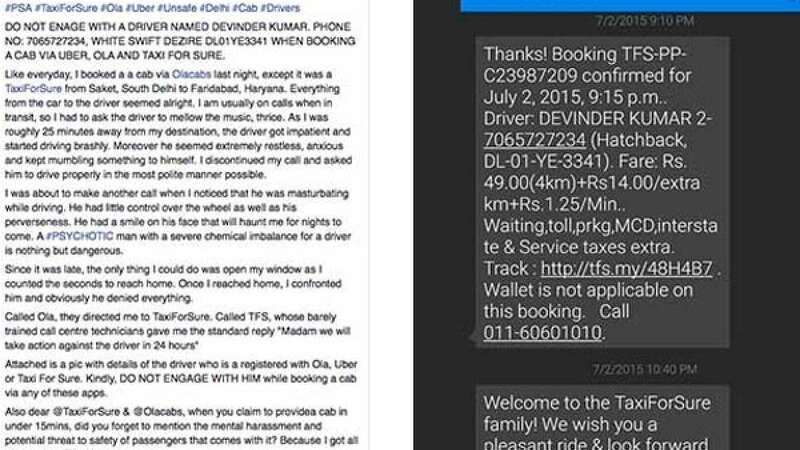 New Delhi : • A woman has made severe allegations over an app based cab service Taxi For Sure driver. Announcing the whole incident on social networking site she mentioned about driver indulging in an obscene act while driving. • According to her, the incident happened last week when she booked a cab from Saket in South Delhi to Faridabad. • In her social post, she demanded a stringent action against the driver Devinder Kumar. • However, no official complaint has been registered by the lady traveller so far. • "When I was about 25 minutes away from my destination, the driver got impatient and kept motioning something to himself. I asked him to drive properly... I noticed he was mas******ing while driving," the woman said in her Facebook post. • "He (the driver) had a smile on his face that will haunt me for nights to come. A psychotic man with a severe clinical imbalance for a driver is nothing but dangerous," her post added. • She also tweeted action taken by service provider. • In her tweet, she said that she met two representatives of TaxiForSure who informed her about the termination of service of the accused driver. "So I met 2 reps frm @TFSCares at my office today who ensured they've fired the driver in question (sic). My only question to them: Is it enough?" she said on the micro-blogging site.